Daily Boater Boating News: Do You Have a Website for Your Boat Yet? There is a new service that offers do-it-yourself websites and blogs for boaters that want to share their adventures at sea. The web-based tools are intuitive if you’ve ever used Word or sent an email (of course you have! ), and they are designed for all types of boaters - from weekend anglers to year-round cruisers. Websitesforboaters.com was founded by Ken Williams, who not only runs the company, but is also its best-known customer! Ken and his wife Roberta publish one of the most popular boating blogs on the web using their own web service - kensblog.com chronicles the couple’s trans-ocean adventures aboard San Souci, their 68 foot Nordhavn trawler. By the way, if the names Ken and Roberta Williams sound familiar, it’s because they were pioneers in the computer gaming industry in the 1980’s and 90’s. Before they decided to make it easier for boaters to blog, they started Sierra On-Line in 1979 and grew it to nearly 1,000 employees before retiring in 1996. Sierra published top-selling and cutting-edge titles such as “Kings Quest”, “Leisure-Suit Larry in the Land of the Lounge Lizards”, “Half-Life”, “Phantasmagoria” and hundreds more. Ken’s started TalkSpot about ten years ago as a hobby to offer point-and-click websites to individuals, small businesses and fund raising organizations, and the service took off. Ken has now combined the proven web-based tools with his passion for boating. Starting a blog or website really is easy using websitesforboaters. You start with a pre-built site, and then make it unique by adding your own photos, videos, blog posts, boat location and more. Your site and updates are made live on the web instantly. 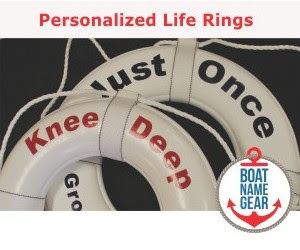 Regular use of the service has an added safety component – your blog entries can double as a float plan to let someone on shore know where you are boating in case there’s an issue. Just make sure you share your new site with friends and family! 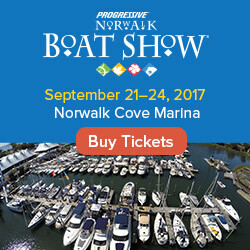 Surprisingly, it seems easier to integrate Google Maps showing your boat’s location on a site built with websitesforboaters.com than it is on Google’s own blogging service (Blogger), at least for the casual computer user; it also seems easier to use a unique web address such as www.your-boat-name.com. You can even get email @ your own boat name web address! 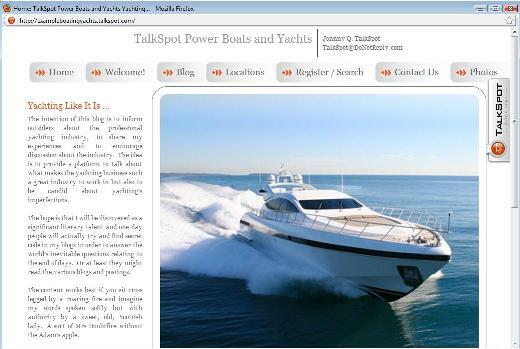 If you are ready to start blogging about your boating adventures, then TalkSpot's newest offering is an easy way to get started. Check them out, on the web at www.websitesforboaters.com. so that they also feel happy and i also get profit..
this post really brought a new idea to me..